And it said there had been a “severe lack of transparency” about the matter. One of the named forces – Avon and Somerset Police – said it had invited several members of the press in to see the Qlik system it used in action, to raise public awareness. “We make every effort to prevent bias in data models,” said a spokeswoman. “These opaque computer programs use algorithms to analyse hordes of biased police data, identifying patterns and embedding an approach to policing which relies on discriminatory profiling,” its report said. Liberty’s report focuses on two types of software, which are sometimes used side-by-side. The first is “predictive mapping”, in which crime “hotspots” are mapped out, leading to more patrols in the area. The second is called “individual risk assessment”, which attempts to predict how likely an individual is to commit an offence or be a victim of a crime. “The launch of a new policing model that places victims and witnesses at its centre has led Kent Police to evaluate alternative options which will support a focus on both traditional and emerging crime types,” a spokeswoman said. 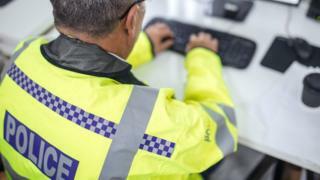 Several forces, however, are involved in a £4.5m “proof-of-concept project”, called the National Data Analytics Solution (NDAS), which is funded by the Home Office. “We want to see analytics being used to justify investment in social mobility in this time of harmful austerity, addressing deep-rooted inequalities and helping to prevent crime,” said Tom McNeil, strategic adviser to the effort.